Pretty Good MahJongg is an addicting new MahJongg solitaire game. Pretty Good MahJongg you can play the classic MahJongg tile matching solitaire game, where tiles are removed in pairs. You can also play original new MahJongg solitaire games such as MahJongg Spider, MahJongg Klondike, and MahJongg FreeCell. 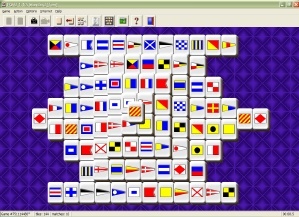 These new games are inspired by solitaire card games, but played with MahJongg tiles. The classic tile matching game in Pretty Good MahJongg is easy to play.It's simple, but it's fun. And it's not as easy to win as it looks. To help you, Pretty Good MahJongg will let you undo a move or every move.